How to practice? How to learn in a better way? These are probably questions which preoccupies many clarinetists. Of course you receive advice from you teachers and colleagues, but sometimes you also need to do your own research to get some perspectives from outside of your own circle. What better way to do that, than reading advice from your role models and world-class teachers. 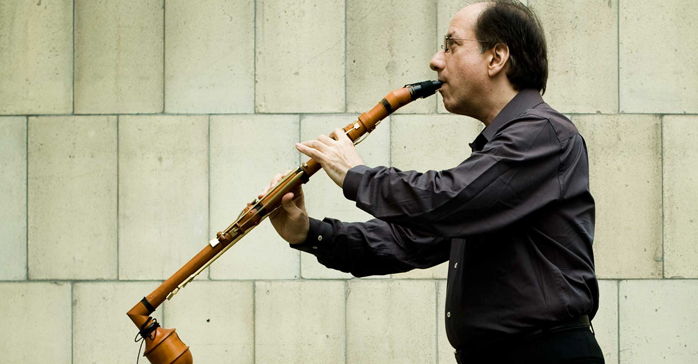 For those of you who are not very familiar with Charles Neidich, he is a world renowned clarinet soloist and professor at the Juilliard School. He was born in a “musical family” and actually took his first clarinet lesson with his father and the first piano lesson with his mother. He is all over the internet if you want to know more. In his video interview for Play with a Pro, Charles Neidich covers a variety of topics from his student life to today’s challenges and influences in classical music.To watch the full video interview go here. I think begging early is really important and quite often wind players begin too late. I was lucky because my father started teaching me to play clarinet when I was 7 and he started me on a e flat clarinet, so a very small instrument, then I graduated to a c clarinet and then to a regular b flat clarinet. It’s incredibly smart, you never should have a little kid playing on a full size instrument. Because of that I never had the feeling that the instrument is clumsy or that it’s large or that it’s heavy. I grew into the instrument. Also, I have to say this - everyone calls me a very natural player. I think that is absolutely true and probably I do a fast synapsis. Aside from that, …. and I think this is the most important point to make, what I did, was I naturally practiced. I never felt that I practiced, but I naturally practiced. I practiced things that most people don’t practice. I practiced different finger patterns which I made up. I would make up my own exercises. I was always involved with the instrument. Another thing that I did was always reading through music since I was quite little. So, it’s this constant activity and this natural ability to practice things which made my playing very natural. 2.What do you advise your students in terms of practicing? This all depends on the student. If you are teaching someone, you have to try to find out what the student needs. Some people can do things on their own, but for some other people you have to actually spell it out. So, I would give exercises to some people, sometimes very detailed exercises and to some not at all and just talk about stuff. 3.What is your process of learning a new piece of music? There are a few things. First of all it’s very important to be able to read music and you will be like “of course”. I am surprised how many musicians can’t really. I think that no matter what the style, complexity or the language of the piece is, music is music. So there is contrast, there is motion, there is drama, there are different moods. I think it’s very important to look at a piece and to put yourself in the place of the composer. If I wrote this piece, why would I write this here and this here and this here? 4.Can you explain why you have a great love for the Brahms and Mozart pieces for clarinet? They are just great pieces. I mean they are great composers. I have love for many great pieces and many composers. These are important pieces for the clarinet, because they are the core of our repertoire and because of these pieces so many other people wrote wonderful things. Both cases represent the culmination of the composer’s technique. But, you have to understand that all music is abstract. there is no such thing as music which is not abstract. 5.Do you see any difference between being a student today and the time when you were a student? It’s very hard for me to say because I didn’t go to a conservatory. I went to the Moscow conservatory after I had graduated from the university. Even though I spent 3 years there, I was free to choose whatever courses I wanted. I don’t know what music students studied in conservatories. I studied ear training with my mother. I think that they are raising the technical bar in the classical clarinet world. I know that now, we try to put the training of the clarinet on the same level as the piano and violin, so you have the same demands. I think that people should not focus only on playing in an orchestra or chamber music. I think that they should be able to do everything. I was never planning to make a career in the orchestra myself. I’ve played in orchestras, but never planned to make a career out of it. It’s not as if you want to be a specialist in contemporary music then you should not learn the classical. I try to give the students an overview of everything. Still people feel the need to specialize and that is absolutely fine, but I think the education, in fact, has become in a way less specialised and more all inclusive. So even if a person is focusing on orchestral excerpts, the person should still play, for example, Elliott Carter. Need more advice? You can watch this free lesson on Begining a note with Charles Neidich or maybe check our the Play with a Pro clarinetists: Lee Morgan, David Campbell, Yeduda Gilard here.